iPhone Photography Awards (IPPA) – Winners of the 2018 iPhone Photography Awards Announced! We are delighted to announce The iPhone Photography Awards™ (IPPAWARDS) 2018 Result. Each photograph was selected from thousands of entries submitted by iPhone photographers from 140 countries around the world. We have listed the names of every winner and honourable mention given in these awards, this is the only place you will find this definitive list, in one place! Huge congratulations to everyone! 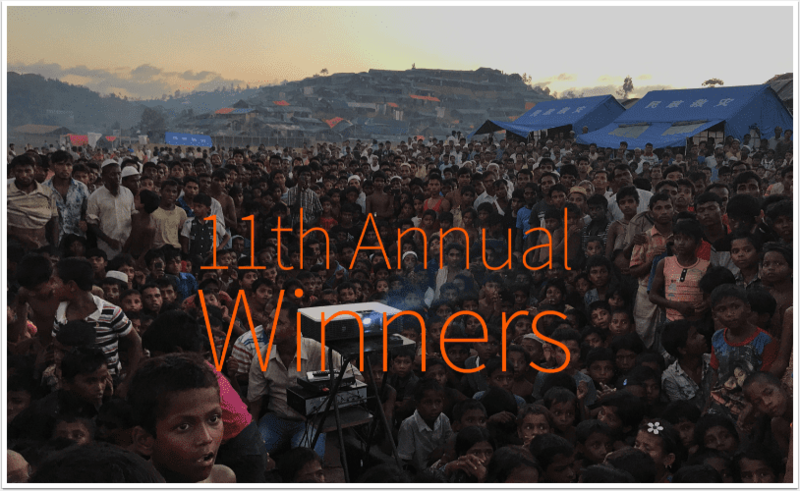 The Grand Prize Winner Photographer of the Year Award goes to Jashim Salam of Bangladesh for his entry Displaced. First, Second and Third Place Photographers of the Year Awards go to Alexandre Weber of Switzerland for his image Baiana in Yellow and Blue, Huapeng Zhao of China for his entry of Eye to Eye and Zarni Myo Win of Myanmar for his image I Want to Play. The 1st, 2nd and 3rd places in 18 categories were awarded to photographers who represented many countries around the world including Argentina, Australia, Brazil, Canada, China, Ecuador, Finland, France, Iraq, Ireland, Israel, Italy, Lebanon, Myanmar, Oman, Philippines, Poland, Romania, Russia, Singapore, Spain, Syria, Switzerland, Taiwan, Turkey, Ukraine, the United Kingdom and the United States. In addition to the winners announced above, many congratulations to: Glenn Homann (who will soon be joining our Online International Gallery and Print Sales), Edwin Loyola, Jedrzej Franek, Robin Robertis, Katie Wall, Erica Wu, Massimo Graziani, KuangLong Zhang, Nasra Al Sharji, Melisa Barrilli, Dina Alfasi, Savadmon Avalachamveettil, Alison Helena Campbell, Zhendi Zhang, Hongjun Ge, Charles Thomas, Asuman Robson, Naian Feng, Natalia Garces, Paolo Mestriner, Sukru Mehmet Omur, Anton Kruglov, Peng Ju Tang, Mohammed Badra, Moises Silva, Veronica G Cardenas, Amy Nelson, Jose Ignacio De Rocco, Magda Lates, Mateusz Piesiak, Burcu Ozturk, Clifford Pickett, Jonas Wyssen, Lee Yu Chieh, Pascal Desapio, Scott Woodward, KuangLong Zhang, Marina Spironetti, Cocu Liu, Laith Zaied, Chen Lin, Fiona Bailey, Song Han, XiangQi Kong, Sara Ronkainen, Ruslan Zabulonov, Anna Aiko, Zarni Myo Win, Soha Ghadour, Lidia Muntean, Brian Grasso, Magdalena De Jonge Malucha, David Hayes, Deena Berton. And to all the Honourable Mentions: David Redhill, Dmitriy Kulyassov, Elma Bourthers, Glenn Homann, John Jester, John O’Niel, Julia Perelra, Julia Zynrha, Laith Zaied, Marton Tordai, Mariacristina Gonzalez, Nigel Hills, Noemie Forget, Raymond Lee, Shusen Jia, Yiannos Zaxhariou, Raymond Lee, Lyueixang Wang, Abdulla Alshatti, Aitor jRubio, Aleksander Jezierski, Alina Fedorenko, Andres Mantoya, Ana Carmona, Burs Clement, Chang Tingwei, Charlene Webb, Chelsea Petersson, Claudia Kurchner, Eugen Persu, Krill Surkov, Lee Potter, Ma Yi, Lee Meng Wei, Latt Aung Ko, Dato Koridez, Gabriel Ribeiro, He LongSheng, Himanshuroy, Fulwala, Hyan Yu, JuliAnne Kaplan, Juan David Lopez Valencia, Magali Chesnal, Marcello Horta, Mateus Alves de Souza, Michael Mons, Nicolas Levesque, Raymond Lee, Songxun Wu, Tingtin Guo, Xi Luo, Yosuke Suda, Yayun Liu, Andrew Clements, Antonia Sisco Anddritch, Beata Krowicha, Burton Rast, Danis Lou, Carolina Nichitin, Demis Velarde, Dilip Vasu Theavan, Hason Kundi, Haibao Tong, Hyde Cheong, Jinson Kliu, Niu Jing Tao, Qian Liu, Janis Straut, Jeffrey Arthur, Linda Hollier, Konstantin Stepnov, Kuanglong Zhang, Lisabeth Armstrong, Mingyang Mai, Mogens Bjergy, Faruk Kuranli, Paddy Chao, Andrew Webb, Ben Williams, Carlotta Marrucci, Dennis Btes, Fared Nassir, Gabriel Ribeiro, Katie Wall, Julia Nathanson, Jon Resnik, Kelly Wotter, Kimberly Moran, Kobi Refaelli, Laith Zaied, Lillia Lipka, Mandy Blake, Melissa Barrilli, Paul Duncan, Nan Deng, Sveltana Markova, Ustun Ozen, Wei Xiong, Yan Lingnan, Xiaodi Feng, Yang Jiao, Yinan Wang, Zarni Myo Win, Benny Lau, Eunhye Son, Ewald Maly, Filipa Domingues, Irina Pasin, Liz Anderson, kristina Crusz, Marianna Garmash, Paddy Choi, Paul Meriki, Nicky Ryan, Syn Li Chan, Yan Zheng, Zhendi Zhang, Shusen Jia, Ami Bai, Bo Peng, Detlef Szillat, Eunhee Park, Eric Zhang, Edgar Dubrovskiy, Jingxian Ma, ardina Zeilony, Kamile Zemaite, Ludwig Wagner, kuanglong Zhang, Kevin Calabrese, Ludwig Wagner, Magali Chesnel, Mariacristina Gonzalez, Mingcun Lu, Rongbin Wang, Rens Jangerius, Rafal Roomotowski, Sari Sutton, Yongmei Wang, Xueiu Lai, Savadman Avalachamuettil, Yan Li, Song Han, Sergey Pesterev, Pengchun Yen, Scott Woodward, Ian Walters, Lucas Lerman, Hongzhen Yin, Elliott Ferguson, Chris Haley, Andre Skagervilk, Camillo Cobberti, Andre Skagervik, Amadeusz Jackiewicz, Vicki White, Hong Liao, Camillo Coloberti, Waldermar Nowak, Zarni Myo Win, Raymond Lee, Kuanglong Zhang, Siwei Chen, Thi Ha Maung, Xin Wang, Liudmila Fakhurdinauei, Robert Radeskie, Carsten Medom Madsen, Laith Zaied, Marion Ben Soussan, Nino Samkhardaze, Peter Adams, Gordona Cavkoska, Latt Aung Lo, Luciana Ciuffin, Hseuh Hua Hong, Caroline Michael, Min Min Zaw, RQ W, Dennis Bates, TsuShao Li, Connor Haines, Lingxing Ouyang, Qiang Zhang, Valencia Tom, Amandine Thomas, Alexander Nikolov, Andrea Kimison, Clifford Pickett, KK, Jen Pollack Bianco, Imperfect Nature, Mathieu Cornelus, Maureen Ruddy Burkhart, Maria Buenaventura, Peng Biao, Sarah Pederson, Shangen Chen, Ted Silveira, Will Lee, Todd Beltz, Weiting Chang, Jen Pollack Bianco, Xirui Huang, Francesca Es, Jormain Cady, Huang Yuting, Hung Ju Chen, Ming Hung Chen, Erica Wu, Nick Browne, Charlotte Popp, Ryan Spoon, Dan Chen, Yujie Liao, Nasir Uddin, Dezhi Xu, Connor Haines, Betsy Peratrovich, Christine Mace, Chaoyue Pan. Read moreiPhone Photography Awards (IPPA) – Winners of the 2018 iPhone Photography Awards Announced!